With the iPad section of the App Store now open for business, it’s time to take a look at some of the games vying for your attention (and dollars). I spoke to several developers who’ve prepped iPad-optimized games for your downloading pleasure. Meanwhile, Globetrotters looks to be the first four-player party game for the iPad. The game’s title is remarkably literal: you play as an astronaut with a jetpack strapped to his back and must catch falling stars before your opponents do. By “trotting” around the planets, you’ll slowly shrink them until they disappear; the last player on a planet scores the most points. This $1 game was developed in conjunction by Broken Rules and Studio Radiolaris; it’s the first release of their new independent games label, Broken Radio Games. The game was originally conceived as a flash application and looks remarkably simple in its gameplay. Hopefully the multiplayer aspect will keep players soaring among the stars for a while. Other apps are hoping to build upon the success they’ve already achieved in iPhone form. FingerArts has announced Hangman RSS HD for the iPad, a clever news-reading game that populates with current news from around the world. 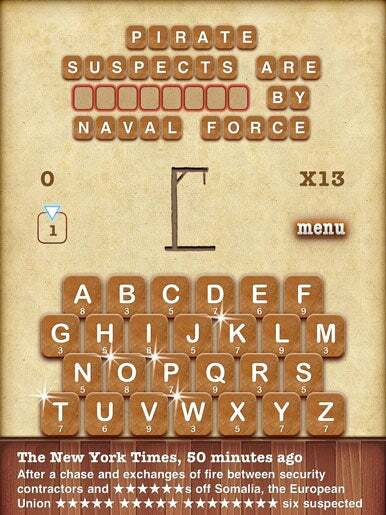 The original iPhone release of Hangman RSS has garnered more than 500,000 downloads and reached several top-ten lists. Hangman RSS, which costs $1 for the iPhone and iPod touch, is a $5 app for iPad users. Like the classic game of Hangman, players must fill in the missing letters of current headlines before their stick figure avatar “succumbs to the noose.” As the game gets tougher, the player must fill in more and more letters in the headline. 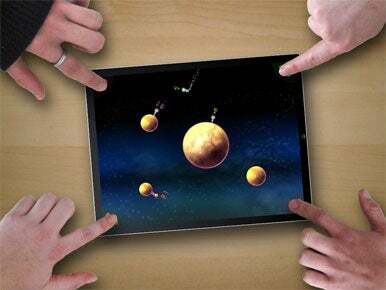 FingerArts’ decision to port the game to the iPad is unsurprisingly given its original success on the iPhone platform and the iPad’s focus on the news-savvy e-reader market.